You are here: Home / Weekend / Jumpy! I spent some time with this, which left me jumpy at every movement in our yard! SCARY!!!!!!!!!! I am loving reading this book though. It’s one I can’t put down, and that’s what I love. 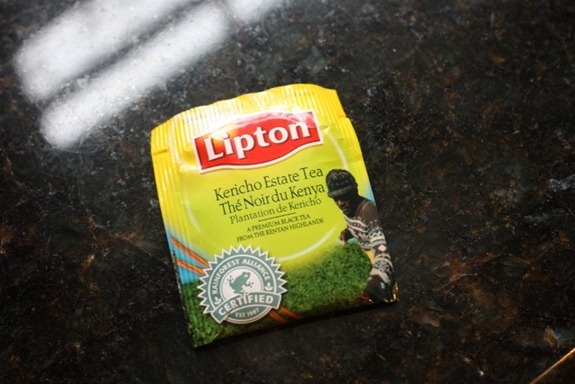 I made some tea with some of my coveted Kericho tea. This is from the estate I visited in March and I save it for special occasions! I also added a little of this Stevia in the Raw to it that the company sent me to sample. I don’t normally sweeten my tea, but sometimes I do for fun. If I had to choose a sweetener of choice, it would be Stevia. I don’t think it tastes the best (hello Splenda!) but I do think it’s the most natural of the calorie-free sweeteners. However I few years ago I was torn between artificial sweeteners and sugar and it suddenly hit me: Oh, just don’t sweeten it. [Whatever it might be]. I just forced myself to get used to unsweetened tea, coffee, oatmeal (banana!) etc. That said, I do like things sweet at times and today was one of them. I also added a splash of egg nog to my tea! I’m excited to try out some kind of baking project with this stuff. Later on this week perhaps? Matt came home from work around 1PM and was hungry for lunch, so we did a canned soup tasting together. Both were samples sent from Amy’s. We heated them and up tasted each to see who claimed what. The Fire-Roasted Southwest Vegetable smelled better in the can, and the Spanish Rice & Red Bean smelled like tin can onion smell. But once heated, the Spanish Rice was really good!! No onion taste at all. It was slightly sweet and thick. The Southwest Vegetable was just OK. Brothy without much substance. Matt really wanted the Spanish Rice so I gave it to him and ate the veggie. He did give me an extra bite though! 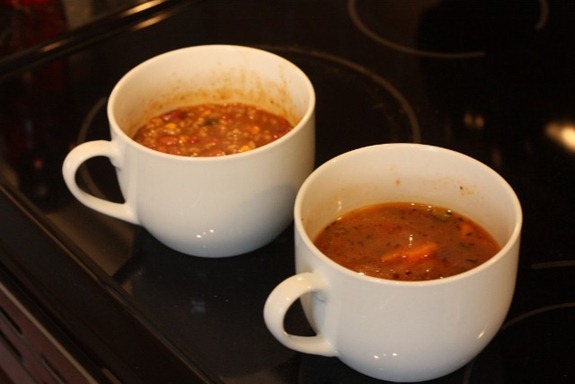 Both of these soups were 280 calories for a can. I was very surprised by that because the Spanish Rice was SO much heartier and the Southwest Veggie was mostly broth. For 280 calories I want fill! Dessert // Palate cleanser = 2 Biscoff! Going to snuggle by my space heater with my book and start thinking about when to eat dinner to time my stomach for a 7:15 hot 90-minute vinyasa yoga class. Still no sign of sunshine! Loved “The Road”! Creepy but so good. My brother was telling me about the movie!! his GF was bawling the whole time, I want to read the book first! 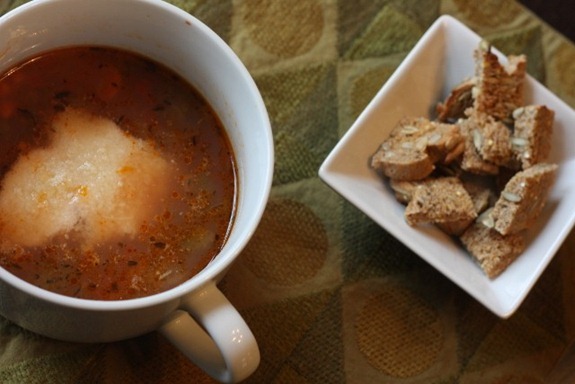 mmm amy;s sounds perfect right now esp with the crusty, chewy bread cubes on the side! Have fun at yoga tonight! Soup sounds so good right now. Too bad about the sun. 🙁 We had a peek of it yesterday, but it was the first bit in a while, and probably the last for awhile! I like NuNaturals stevia the best, but in a pinch I go for stevia in the raw. 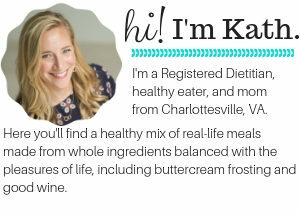 I am so utterly in love with everything Amy’s Kitchen and they are a fantastic, responsive company. But I was disappointed to discover yesterday that their cans aren’t BPA-free (http://organicgrace.com/node/316). Eden Foods seems to be the only (organic) brand that makes their cans without BPA — at a cost ~$300,000/year(! ), from what I read. More is here: http://www.huffingtonpost.com/nena-baker/how-eden-foods-pioneered_b_232135.html. Anyone have thoughts on this? I had the SAME EXACT thing for lunch (spanish rice) LOVED IT! I need to get my hands on that book. It looks really good! Try your local library or used book store. It’s a few years old. i love books that you can’t put down. a good book makes for a very fun day/evening! Ooooh that looks like a book I want to read! I use Stevia as well but would love to stop sweetening my tea/coffee altogether. How long did it take to ween yourself off? Kath or anyone else who has managed to accomplish this? I’ve actually never sweetened my coffee or tea, but I have cut sweetner out of other things. 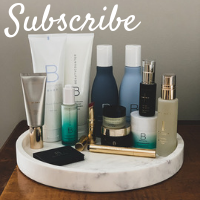 I just started by cutting back how much I used, using less every couple of days. Really it doesn’t take long. You might however, find that you don’t like the flavor of black coffee, or plain tea, and then you might have to search out another drink, or make peace with sweetening just one or two things. I drink my coffee black (and my lattes unsweetened/unflavored). I don’t, however, like plain tea, so that gets a splash of milk. In the afternoons I often drink flavored herbal teas (apple cinnamon by Stash is my current choice) since caffeine keeps me awake. I had my iced tea with lunch the other day without sweetner and it wasn’t too bad. An extra squirt of lemon helped. I have that same mug but only with Seattle featured – I love how large it is! Such a good novel. I really want to read some of McCarthy’s other stuff. I agree that the Southwestern is a bit thin, but I love the fire-roasted spicy flavor! Soup, a good book and a space heater on a cold day is wonderful. I could go for that right now if I wasn’t so busy. 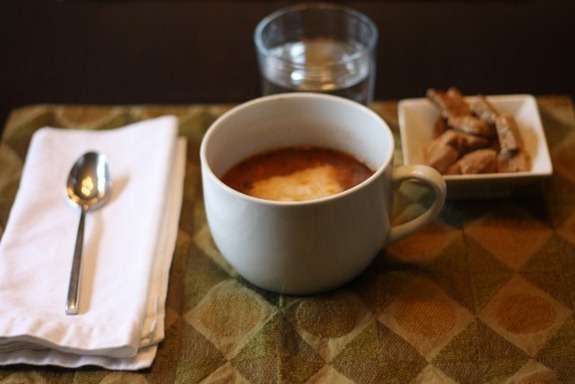 I like some of Amy’s soups, but others I find to be too bland. Hit and miss I guess! 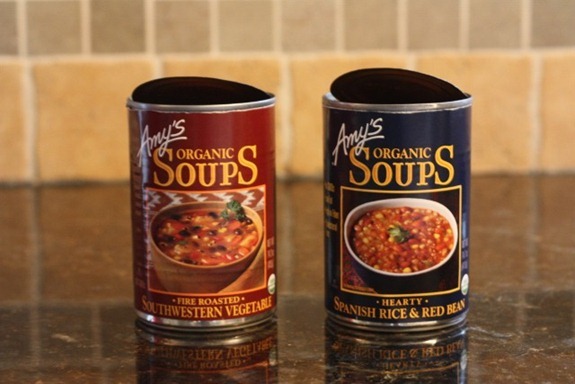 I love Amy’s soups, my favorite is the Lentil! Gotta say, I wasn’t too impressed with the Southwestern Veggie either. Stay warm! 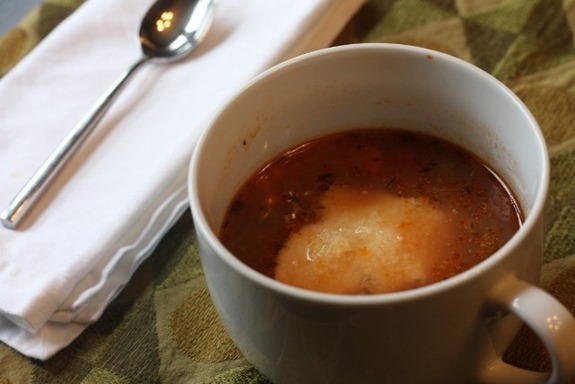 This soup is making the rounds today! How’s the salt content? Sorry there’s no sunshine! 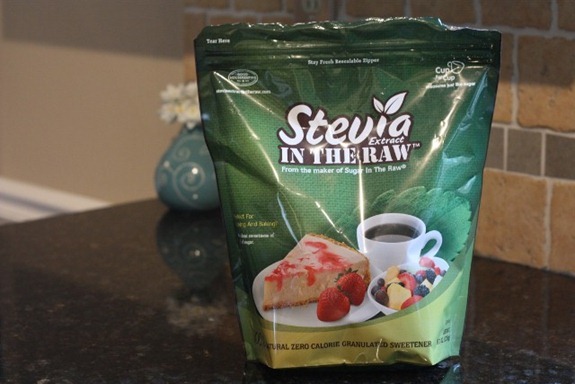 Can’t wait to see how baking with the stevia in the raw goes! I’m still addicted my Splenda in my oatmeal, but don’t use anything in my tea or coffee. I thought I was doing ok with my consumption but then realized that the yogurt I eat (a lot of) contains Splenda. I’m so torn of the debate. But my oatmeal and yogurt start my day and make me happy. I don’t have a third head-till then I’ll keep eating it. good idea – the taste test! I don’t really add artificial sweetener to anything. I did used to sweeten my tea, but then one day I just stopped, and it only took a few days to get used to unsweetened tea. Now I appreciate the actual flavor of the tea more. i’ve yet to try stevia in the raw but have been pretty happy with nustevia’s products since they sent me a whole bunch of their stuff to try….no aftertaste. is stevia in the raw bitter at all like other stevia i’ve tried? I always love your toast cubes. So much cuter than a whole piece of toast : ) If I made them, they would probably end up in my soup. I’m goin’ to 7pm yoga myself…I always eat a small snack, and have dinner after. Tastes better after a good yoga class! Oooh, I think I have that book! Is it about a boy and his father? Those soups sound delicious! I just ate some biscoff for the first time last week. They were passing it out on a plane I was on. Hot yoga sounds so good right now – it’s cold here and I am in desperate need of some serious stretch! I use Stevia now when I need a sweetener– I’ve gotten pretty used to the taste, but I think it does have a hint of bitterness. Have fun at your hot yoga class! 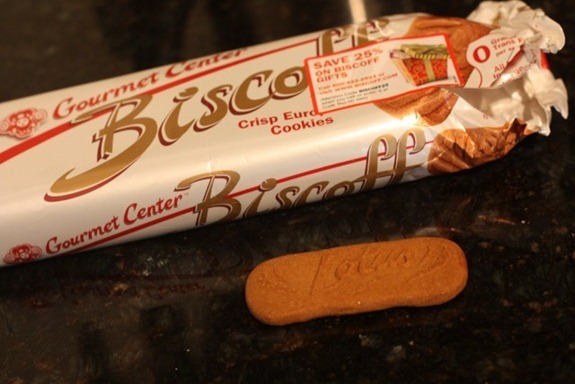 ive had those biscoff once on a plane and they were delicious! How fun that you and Matt got to share a nice lunch together. I’m such an Amy’s fan, but I’ve actually never tried either of those flavors. Both really do sound good though! 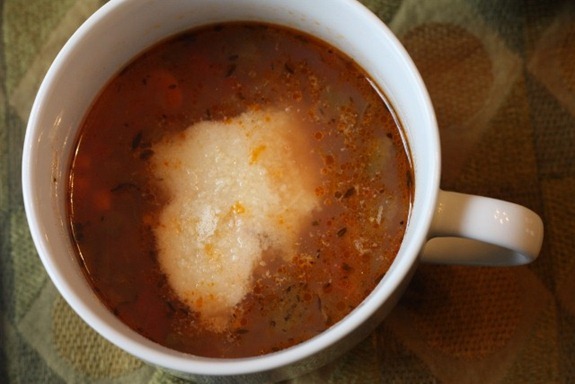 mmm love soup in the winter time! I can’t wait for winter break to start so I can read fun books! I haven’t decided what to read yet but I figured I’d hit up the library in my hometown! I go unsweetened with my tea..but I just can’t do it with my coffee. 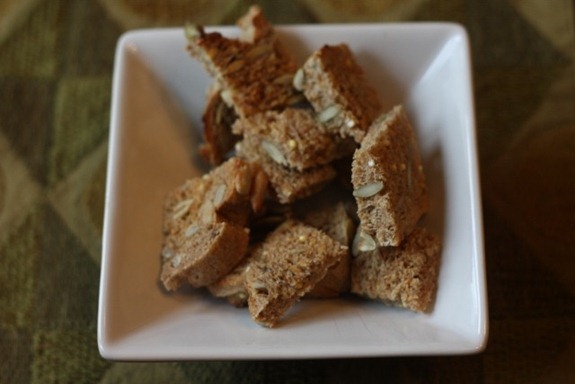 Stevia is a life saver there… Oh, and I looove biscoff! I finally tried the sugar cookie herbal tea that I saw on here a while back. I can’t believe I waited so long to try it! 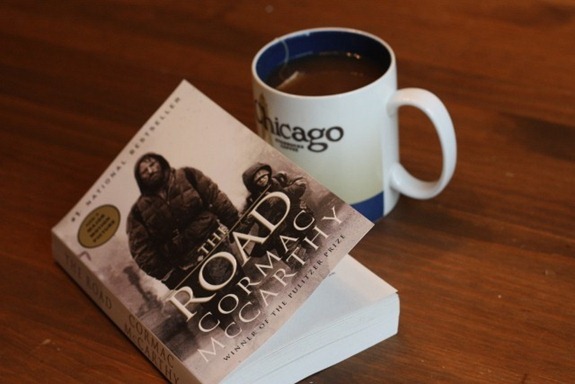 I read The Road last week and couldn’t put it down either. I love books like that and haven’t read one in too long. I saw the movie last night and LOVED it! Almost every scene was exactly how I imagined it and I felt all of the emotions I felt while reading the book. hmm… that looks real good. I wish Central Florida needed space heaters 🙁 It’s reaching mid 80’s here! Not so Christmas-y! Your lunch is exactly what I had for dinner 🙂 Hmmm maybe I’ll need to give that book a try. Right now I’m reading a book called ‘Stiff’…it’s a little dark but humorous 🙂 ENjoy your yoga class! I’m going to see The Road with my boyfriend next week. It’s in limited release up here so we have to drive 45 minutes to see it! His favorite movie is No Country for Old Men so I bought him The Road last year for Christmas. He is reading it a second time now. Can’t wait to hear your thoughts on it!